The theme of this blog is fall colours, so I must talk about RED. #ELXN42 is just 5 days away and it seems surreal, but the Liberals are leading in the polls by roughly 6 percentage points. 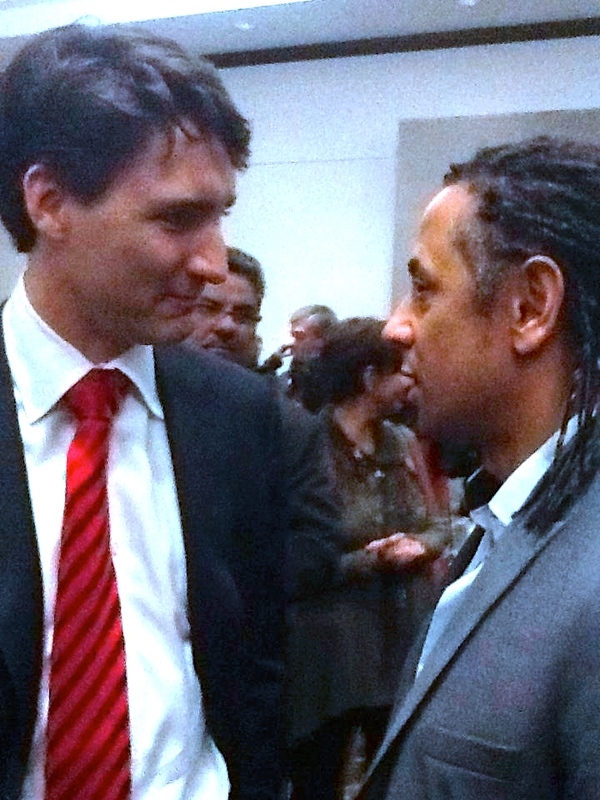 I met Justin Trudeau at the final Liberal leadership debate on February 16th, 2013 in Mississauga. It was a pretty, snowy afternoon and all my regular political buds were unavailable, so I popped into an Autoshare car and drove up by myself. I run one of the top hair salons in Toronto – worldSALON – and after 26 years, have a most impressive clientele. Back in 2013, it was perplexing that even my smart, very successful clients were just regurgitating the sound bites about Justin – too young, silver spoon, a teacher? …. This is why I really felt that I had to meet him for myself. My homework was reading Volume One of John English’s excellent biography of Pierre Elliot Trudeau – Citizen Of The World. Diving in, I reached out my hand and his warmth and attention enveloped me. For the minute plus that we talked, it felt like there was no one else in the room. I introduced myself and thanked him for joining the race, giving Canadians a viable option to Harper. I then asked what he thought of Citizen Of The World – “Great book about my father, he replied. “What will you do when Harper starts up the attack machine?” was my next query. “Canadians don’t want that kind of politics and the Liberals aren’t going to engage on that level, he responded. It has been surprising how honourable a campaign the Liberals have run, despite all the opportunities for negativity! Up until that point, I was a believer in fighting fire with fire, but he has proved that taking the hight road was better. Next was a question about fundraising, and he pointed out his head adviser, Gerald Butts. We shook hands again, I thanked him again and someone else took my place. A pretty good judge of character, I am relieved and excited that Justin Trudeau has turned out to be the real deal. For a year and a half, as many of my clients can attest, I have been trumpeting the man’s authenticity – a refreshing change from the blatant lies and manufactured world of the previous government. Justin’s performances during the debates were a turning point for the campaign, as Canadians finally got to meet him on TV and realize what I had on that snowy afternoon. The release of the Liberal plank about infrastructure spending and three years of deficits was timed perfectly and dovetailed nicely with the debates, giving Canadians something to dream about again. Justin Trudeau will govern for 100% of Canadians, Harper has only ever led for his base, a shrinking 30%. Kudos to the Liberal team for a masterful campaign. For those 18 to 30, please get out and vote for the country you want. Hopefully the Conservatives and NDP will elect new leaders that will turn away from the divisive rhetoric of the past. Canadians will then come together once again, to work for a better, healthier future for ourselves and our planet, regardless of political affiliations. But this fall, I see a lot of RED!